A collection of my life (mis) adventures on being a wife, mom, daughter, friend, and anything in between. 1 Cor 10:13 "Our God is a faithful God"
We had our routine last March 10, 2019, visited a pilgrimage site at Laguna just to unwind and sort of reflect and destress from everyday busyness of life. But when we're heading back home, we got into a not-so nice motor experience. Good thing rescue was fast, napalibutan ako ng mga tao agad dun, I was rushed into Laguna's hospital. When all the procedures were done, the doctor from laguna said once lumuwas na kame sa manila eh pacheck kame agad sa ortho, ortho na daw ung magsabi if pasurgery or what. Then we had our checkup, 1st ospital pinoint out kame sa Philippine orthopedic kasi wala silang water and yung waste management facility nila umapaw which hindi nagpafunction ung ER nila. Then pumunta kame sa 2nd hospital, nagpasched sa ortho. He is an ortho surgeon, chineck ang xray and then sabi I need a surgery lalagyan daw ng bakal, shookt ako... Umuwi kameng troubled ang heart ko, naiyak na ko ganyan dumaan kame sa malapit na simbahan, medyo naquestion ko si God but at the end of the day, just cried out to Him and surrender everything according to His will. Then this tues we went to another hospital, hindi kame naaccommodate, this is not an ER case na daw kasi ilang araw na daw ang nakalipas, sa opd na daw kame magpacheck though pinakita namen ung xray ko. Then out of nowhere may mga tao ulit pointing us to POC even tnvs drivers sharing their experiences. For those days na nagdaan, wala akong tulog na maayos. Parang every hour nagigising ako and cant even eat normally. Iniisip ko kasi ano mangyayari sa mga susunod na araw. Then we decided to go there earlier ng March 13 sa POC, mga 3am or 4am ata kame umalis. Naentertain kame agad though nagising sila sa pagkakaidlip, hindi sila masungit, new set of xray ulit, though nakita nila ung first xray ko sabi ng dr na tumingin tsk tsk tsk.. sobrang ipinaubaya ko na lang kay God kung ano mangyari. I also utter before pa kame makarating sa POC na hoping that all people na makakausap namen will have a big heart and be accommodating and Siya na bahala kung ano man mangyari. Then had the new xray. The doctor who read my new xray (ortho surgeon sya dun) told me no need for surgery or cast or anything. 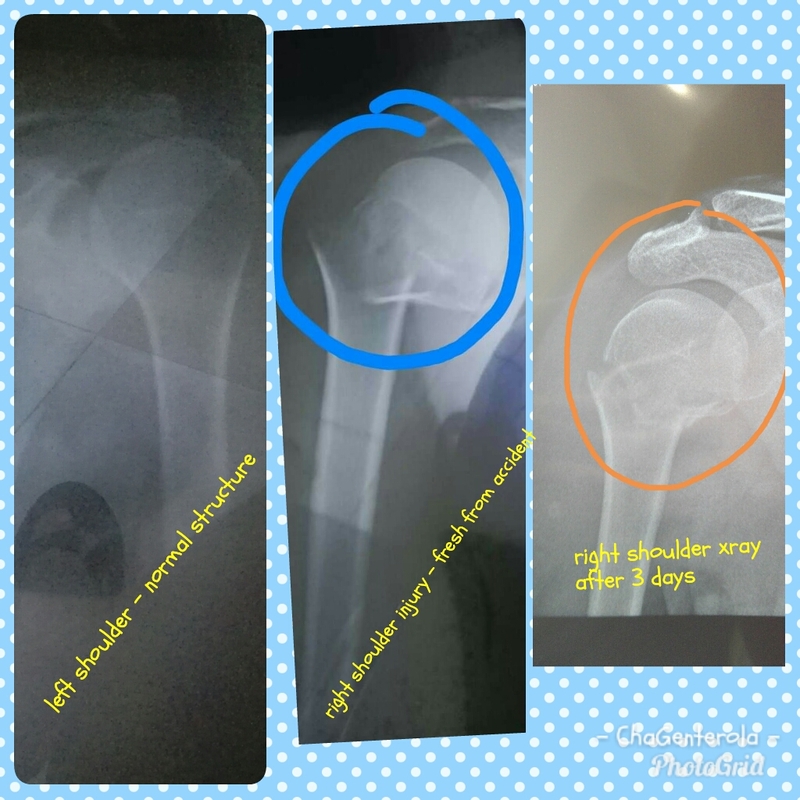 Inulit ko ung tanong ko, tas pinakita niya ung bagong xray, sabi niya "it will heal in time." Those words makes my heart jump high dahil sa tuwa. All I said to them is thank you to everyone with a big smile from my face. It's like nabunutan ako ng pagkarami raming tinik sa katawan. So what's the point of posting this? Just sharing a big miracle in my life. This help me realize lots of things, and test my faith and my relationships. Salamat sa pamilya ko, sa partner ko at sa mga kaibigan kong naglift ng spirit ko pati sa mga taong nakilala namen along the way and sa work ko. And my greatest Thank you to our Almighty God for giving this early lenten gift. Kaya ikaw, kapit lang, wag ka mawawalan ng pagasa. Those challenges we are facing are just way of God calling our attention to seek Him and trust Him. Remember it is good to slow down today in our world of full of rush and busyness. Waking up is already a miracle from Him. So remember to make time to Seek Him, Talk to Him, Listen and Reflect. Have a blessed night to you! Alternergy which operates Bangui Windmills in Ilocos Norte constructed a wind farm in Pililla, Rizal. Pililla Windmills in Rizal are on top of the hills overlooking the beautiful plane of Tanay Rizal on one side and Laguna on the other. It will surely be one of the great destination you can go along Rizal area. From Starmall Van Terminal / Jeepney Terminal in Shaw Boulevard or Araneta Center, Cubao, you can ride a jeep or van going to Tanay, Rizal. Get down at the junction or the Tanay Public Market in Sampaloc. Travel time is about 2-3 hours depending on traffic. Hire a tricycle going to the Wind Farm. Rates are negotiable. It’s better if you’re in a group so you can split the costs. Drive along the Manila East Road to Tanay. At the fork in the road, turn left to the road leading to Real, Quezon. Villa Lorenzo Resort is the sign that you are already near at the windmill. Drive up the hill, and check the entrance to the wind farm on your left. As I mentioned on my about me page, I am a B.S. Information Technology graduate but I wasn't able to practice my computer programming skills. Hence, now I missed doing it so much. I just realized recently, that I love doing things which involves analytical and critical thinking. Oh well, I guess it's still not too late to go back and explore the world of coding. • It's one of the most Udemy’s most popular courses with 4.3 star rating out of 5. • There are total of 47 lectures, with 4 hours of total content on this course. • The course is aimed at beginners, and provides a comprehensive overview of the most popular coding language on the web. What is the target audience if this course? • Bloggers-- even if you use Wordpress or another CMS! Normally, this course costs $49. However, since you are a reader of my blog, you can have the course for only $10! That's 80% off! Isn't that great to know?! (Happy dance!). Here's what you need to do, enroll in the course now, just click redeem a coupon and input my special coupon code: "http://lyrahcchronicles.blogspot.ca/" to avail the discount. I'm so excited to go back and learn one of the popular language now! Let's enroll & avail the super discounted price! Enjoy learning! Happy happy birthday anak! I know I am strong because of you and I will continue to be strong (much! much pa!) para sa inyo ni caleb. I really love you, always will. To the infinity and beyond nga ang peg natin kahit madalas tayong aso't pusa. Walang sawang bangayan. Haha pero sa totoo lang, I love you anak! Always & Forever! I hope you'll grow as fine lady who loves God eternally. May God bless you always! Opened a BDO Junior's Savers Club Account today!